For over thirty years Christina Kubisch has worked with the system of electromagnetic induction. In 2003 she started work on the series Electrical Walks, in which she makes audible the real time electromagnetic fields that surrounds us. In the Art Slam Christina Kubisch explores the stage situation of the symposium and makes that which is usually inaudible to us acoustically tangible. 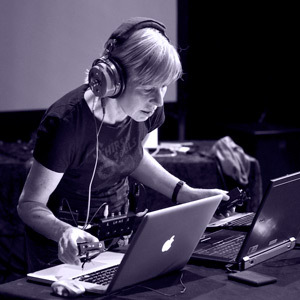 Christina Kubisch, composer and sound artist. Until summer 2013 Professor of Audiovisual Art at HBK Saar. In her works she operates with different spaces, designs fictional spaces from electronic materials or designs the idea of a fictional nature by means of sound and light. In 2008 honorary award of the Deutscher Klangkunstpreis. Currently resident urban sound artist at the Beethoven Foundation in Bonn. Lives and works in Hoppegarten near Berlin.